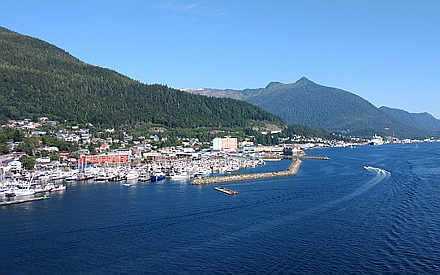 Juneau, the capital city of Alaska, is huge. But it’s huge only in land and not in population. The unified city and borough of Juneau have a population of about 32,000 people, but the actual land covers more than 3.2 million square miles. It is larger by area than both Delaware and Rhode Island. Cruise visitors will travel through the narrow Gastineau Channel between dominating mountains to disembark in a narrow in this isolated city. What also makes Juneau both isolated and unusual is the lack of roads connecting the city to the rest of the state. There are none. For cruise visitors, the only major road outside of the city is Route 7, which will take them to the cruise port’s most popular attraction. That attraction is the half-mile-wide Mendenhall Glacier, which has ice 300 to 1,800 feet deep. The visitor’s center is about 13 miles or 23 minutes by car, taxi or excursion bus north of the cruise terminal. Mendenhall Glacier is one of the best attractions for Alaska cruise visitors because it allows them to take an easy hike to reach it. The viewing points across Mendenhall Lake and next to the roaring Nugget Falls also add to the enjoyment. The park has several hiking trails ranging from a half mile to nearly seven miles long. It also has a National Park Service visitor center. The most popular one goes from the visitor center to Nugget Falls, which is about one mile away. Highly experienced hikers can hire tour guides for longer treks onto the glacier. A shuttle bus will cost about $30 round trip per person. Look for kiosks selling tickets near the Mount Roberts Tramway. Mendenhall has one other experience unique to the glacier and Juneau. Excursion operators offer a three-and-a-half hour rafting trip from Juneau to the glacier and back again. It’s a family-friendly excursion because the river rapids reach only Class II and III (the easiest is Class I and the hardest is Class V). Other excursion companies offer canoe and kayak tours of Mendenhall Lake and the glacier. All three options range in price between $150 and $250. Visitors at the cruise docks can’t miss the Mount Roberts Tramway. It’s right by the docks next to Juneau’s tourism district and climbs nearly straight up the mountainside. That ride up the mountainside has views that might make people go, “wow”. Tram cars rise 1,800 feet from the cruise ship dock through the rainforest to the Mountain House at the top. It offers wide, photographic views of Juneau and Gastineau Channel. The Mount Roberts Tramway is one of the most vertical tramways in the world, according to the website. The area at the top has a restaurant, a bald eagle sanctuary and various hiking trails that offer more views of the surrounding mountainsides. The hiking trails had one downside: a tremendous number of mosquitos, so bring repellent. The Glacier Gardens, eight miles north of the terminal and five miles south of the glacier visitor center, is a “rainforest adventure” in Tongass National Forest. The 50-acre facility is known for its upside down “flower towers”. The city itself has a variety of small attractions within walking distance of the cruise terminal by turning left and going on Franklin Street until it reaches Main Street. The Alaska State Museum has a large collection of art, historical and natural history objects and exhibits. It is a half mile from the cruise terminal at 395 Whittier Street. A half mile from the cruise terminal on Main Street at the corner of 4th Avenue is the small Juneau-Douglas City Museum. It displays exhibits about the culture and history of the Juneau and Douglas area. Across the street is the Alaska State Capitol, which has free tours during the cruise season for anyone with an interest in government, politics and history. Otherwise, Juneau offers cruise visitors they usual tours and excursions including whale watching, flightseeing and dog sledding. Juneau is the busiest cruise port on the Alaska coast with more than 1 million visitors every year and growing. The port has five docks in or near the town. Most of them are close enough for passengers to walk into town. A few are far enough away that visitors will want to take the free shuttle service that was available when we went there. The docks are close to the main tourism district, which is easily walkable for anyone who is even modestly fit. Outside of the tourist area, visitors will need a taxi, rental car or excursion bus to reach the best attractions. Juneau in my opinion doesn’t offer enough reasons to hire a rental car for the day. Taxis are rather expensive. So anyone who plans to visit attractions outside of the city will likely take an excursion bus. Juneau has two temperature patterns during the Alaska cruising season from May through September. The months of May and September have an average daytime temperature in the upper 50s Fahrenheit, according to the U.S. National Weather Service. From June through August, the average daytime temperatures hover in the low 60s. Nights are chilly with the average temperatures ranging from the high 40s to low 50s. May, June and July are the driest months. They average more than five inches of precipitation per month (mostly rain). Precipitation climbs to nearly eight inches in August and nearly 13 inches in September. So like most Alaska coastal cities, the best time to visit Juneau is in June or July.